For the past few years I have been studying for a degree in film and drama at a college here in Dublin city. It is a part time evening course so the twelve weeks semesters have defined my autumn and spring seasons over the past few years. There was a great emphasis on Irish film in our many film modules and through the course I discovered several Irish films I wasn't familiar with or in the case of ones that I knew already I saw them in a different perspective or point of view. One aspect of Irish films that I love is the diverse range of short films that have been made in this country or partly funded projects from other countries that involve Irish film making personnel. I would like to highlight some of my own favourite Irish short films. The first film that I want to feature is one that I never tire of watching. It is Granny O'Grimm's Sleeping Beauty which was produced by Brown Bag Films and was directed by Nicky Phelan. 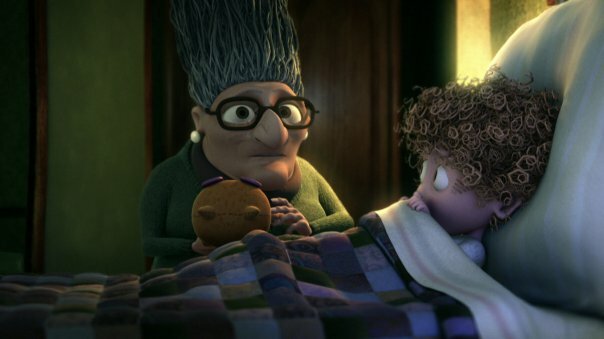 It was written by Kathleen O'Rourke who originally created the character of Granny and I think what absolutely makes the film is that Kathleen also voices Granny in the short film. I know that the character of Granny instantly reminded many Irish viewers of a granny, aunt or neighbor from their own childhoods but the humour and structure of the short was also one that made an impression on audiences worldwide too. The film was a success at various film festivals and was also nominated for the Best Animated Short Film award at the 82nd Academy Awards in 2010. Brown Bag Films have since the release of their Granny O'Grimm short film have become even more successful with their creation and production of The Octonauts TV series for CBeebies and The Happy Hugglemonsters and their most recent and acclaimed Doc McStuffins TV series for Disney Junior which is now in a second series. Here's Granny O'Grimm's Sleeping Beauty.